Brandon Meriweather (born January 14, 1984) is an American football free safety who is currently a free agent. He played college football at the University of Miami, and was drafted by the New England Patriots in the first round of the 2007 NFL Draft. Meriweather has also played for the Chicago Bears, Washington Redskins, and New York Giants. Meriweather's mother gave birth to him when she was 13 years old. Meriweather started living with his adopted parents at age 11. Meriweather attended Apopka High School in Apopka, Florida where he helped lead his school to the Florida Class 6A state championship as a senior in 2001. He started as a kick returner, returning four kicks for touchdowns as a senior. He also lettered in track and basketball. Meriweather received an athletic scholarship to attend the University of Miami and play for the Miami Hurricanes football team. In 2002, Meriweather played in three games and had three total tackles before injuring his ankle, and was given a medical redshirt by the NCAA. In 2003, Meriweather played the majority of the season on special teams and in different nickel and dime packages. He got his first start against West Virginia as a nickel back. He finished the year with 22 tackles, one interception and five pass break-ups. On July 21, 2006 Meriweather was involved in a shooting incident when teammate Willie Cooper was shot in the buttocks. In self-defense, Meriweather returned fire and shot at the unidentified shooters three times. Meriweather was not charged with a crime because his gun was owned legally. Meriweather was selected in the first round (24th overall) of the 2007 NFL Draft by the New England Patriots. During his rookie season most of his time was spent on special teams, and he finished the season with 28 tackles. He played in Super Bowl XLII as a third safety in the Patriots' defense behind Rodney Harrison and James Sanders. During his second season in 2008, Meriweather recorded his first career interception in Week 2 off New York Jets quarterback Mark Sanchez. After starting strong safety Rodney Harrison suffered a season-ending injury against the Denver Broncos in Week 7, Meriweather started the final 11 games. In Week 14, Meriweather recorded his first career sack to stifle a late-game Seattle Seahawks drive and secure a Patriots victory. He finished the season with 83 tackles, two sacks, and four interceptions. 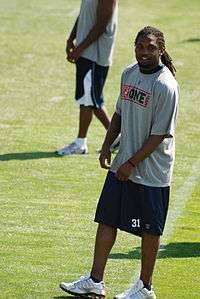 Brandon Meriweather was not part of the Patriots base defense to begin the 2010 season, something which Meriweather described as a coaching decision as a result of him freelancing in the defense during training camp. After being replaced as a starter in Weeks 2 and 3 by James Sanders, Meriweather returned to his starting role in Week 4. On August 16, 2015, Meriweather agreed to terms with the New York Giants. On December 16, 2015, Meriweather was released by the Giants. On December 23, 2015, Meriweather was re-signed by the Giants. On April 25, 2012, Meriweather was arrested in Arlington County, Virginia, on suspicion of driving while intoxicated, according to a press account. Meriweather was initially stopped for speeding on westbound I-66, according to Arlington County Police spokesman Dustin Sternbeck, who also said that officers detected an odor of alcohol on his breath and performed a field sobriety test, which Meriweather failed. Sternbeck further stated that Meriweather refused a breathalyzer test, was arrested and spent the night in the Arlington County jail. According to the press account, "Police say Meriweather claimed he was driving home from a club in D.C., but couldn’t remember the name of the club." ↑ Gasper, Christopher L. (2007-05-11). "Branded unjustly?". The Boston Globe. Retrieved 2007-07-18. ↑ Ulman, Howard (2007-04-26). "Pats could focus on defense in draft". Associated Press. SeaCoastOnline.com. Retrieved 2007-07-18. ↑ "Miami safety Cooper shot, teammate returns fire". Associated Press. ESPN.com. 2006-07-21. Retrieved 2007-07-18. ↑ "Miami, FIU have 31 suspended for role in brawl". ESPN.com. 2006-10-16. Retrieved 2007-07-18. ↑ Garafolo, Mike (2007-04-17). "Interview with Meriweather". The Star Ledger. Retrieved 2007-07-18. ↑ Price, Christopher (2009-10-28). "Meriweather wins AFC weekly honor". WEEI.com. Retrieved 2009-10-28. ↑ Rapoport, Ian (2010-09-20). "Why Patriots S Brandon Meriweather hasn't been starting". The Boston Herald. Retrieved 2010-10-28. ↑ "NFL fines 3 players total of $175K". Associated Press. ESPN.com. 2010-10-19. Retrieved 2010-10-22. ↑ Mike Reiss, Meriweather told he's to be released, ESPN, September 3, 2011. ↑ Pompei, Dan (September 4, 2011). "Bears sign former Patriots safety Meriweather". Chicago Bears. Retrieved 4 September 2011. ↑ "Chicago Bears, Brandon Meriweather agree to one-year deal". Sportingnews.com. Retrieved 4 September 2011. ↑ "Bears agree to terms with Meriweather". The Sacramento Bee. 4 September 2011. Retrieved 4 September 2011. ↑ "Meriweather agrees to one-year deal with Bears". CBS Sports. Retrieved 4 September 2011. ↑ Biggs, Brad (October 14, 2011). "Another week, another fine for Brandon-Meriweather". NationalFootballPost.com. Retrieved 2012-05-26. ↑ "Tom Waddle rips Brandon Meriweather". ESPN.com. October 11, 2011. Retrieved 2012-05-26. ↑ Jones, Mike (2012-03-15). "Redskins agree to terms with safety Brandon Meriweather". WashingtonPost. Retrieved 2012-03-15. ↑ Jones, Mike (September 5, 2012). "Brandon Meriweather out two to four weeks with new knee injury". WashingtonPost.com. Retrieved 2012-09-05. ↑ Jones, Mike (September 28, 2012). 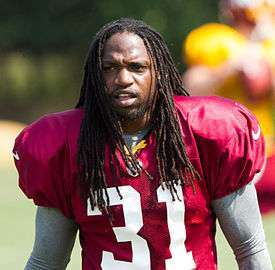 "Brandon Meriweather 'ecstatic' about prospects of making Redskins debut". WashingtonPost.com. Retrieved 2012-10-02. ↑ Campbell, Rich (October 1, 2012). "Brandon Meriweather out a week, Aldrick Robinson out indefinitely after collision". WashingtonTimes.com. Archived from the original on 2012-10-05. Retrieved 2012-10-02. ↑ Tinsman, Brian (November 19, 2012). "Meriweather Has Torn ACL, Done For Season". Redskins.com. Retrieved 2012-11-20. ↑ Tinsman, Brian (November 20, 2012). "Redskins Sign Murphy, Meriweather To IR". Redskins.com. Retrieved 2012-11-20. ↑ Pelissero, Tom (September 18, 2013). 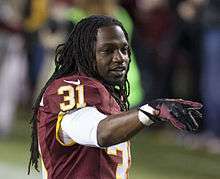 "Redskins safety Brandon Meriweather hit with $42,000 fine". USAToday.com. Retrieved 2013-11-27. ↑ Jones, Mike (September 18, 2013). "Brandon Meriweather fined $42,000 for helmet-to-helmet hit". WashingtonPost.com. Retrieved 2013-10-21. ↑ Maske, Mark (October 20, 2013). "Meriweather likely faces suspension or hefty fine after two penalties Sunday for illegal hits". WashingtonPost.com. Retrieved 2013-10-21. ↑ Pelissero, Tom (October 21, 2013). "Redskins' Brandon Meriweather suspended two games". USA Today. Retrieved October 21, 2013. ↑ Florio, Mike (October 23, 2013). "Meriweather suspension reduced to one game". Pro Football Talk. Retrieved 2013-10-23. ↑ Maske, Mark (October 23, 2013). "Meriweather suspension reduced to one game". WashingtonPost.com. Retrieved 2013-10-24. ↑ Keim, John (November 2, 2013). "NFLPA talks to Brandon Meriweather". espn.com. Retrieved 2013-11-03. ↑ Keim, John (October 28, 2013). "Brandon Meriweather rips Marshall". ESPN.com. Retrieved 2013-11-27. ↑ Boyer, Zac (October 28, 2013). "Brandon Meriweather takes a personal shot at Brandon Marshall". WashingtonTimes.com. Retrieved 2013-11-27. ↑ Peliserro, Tom (October 29, 2013). "NFL won't discipline Brandon Meriweather for talk about targeting opponents' knees". USA Today. Retrieved 2013-11-03. ↑ JONES, MIKE (March 17, 2014). "Redskins re-sign safety Brandon Meriweather to one-year deal". WashingtonPost.com. Retrieved 2014-03-17. ↑ Florio, Mike (August 25, 2014). "NFL suspends Meriweather two games". Pro Football Talk. Retrieved August 25, 2014. ↑ "Redskins-Cowboys Tuesday Stats Pack". Redskins.com. October 28, 2014. Retrieved 2015-01-04. ↑ Gantt, Darin (December 19, 2014). "Washington puts Brandon Meriweather on IR". NBCSports.com. Retrieved 2014-12-23. ↑ "Giants release safety Brandon Meriweather". Giants.com. December 16, 2015. Retrieved December 26, 2015. ↑ Eisen, Michael (December 23, 2015). "Two-way player Nikita Whitlock to IR; Brandon Meriweather signed". Giants.com. Retrieved December 26, 2015. ↑ "Brandon Meriweather Stats". ESPN Internet Ventures. Retrieved 24 January 2014. ↑ "ArlNow account of DUI arrest". ArlNow.com. 2012-04-25. Retrieved 2012-04-26.